also has some kind of a mansion – which, I might add, is actually pretty common here in the UK. For some reason no one rushes out from the manse to invite us in, so we travel on. We encounter, unanticipated, this roofless ruin just off the road and decide to investigate. There’s nobody here but us and an historical sign to tell us what we’re seeing. 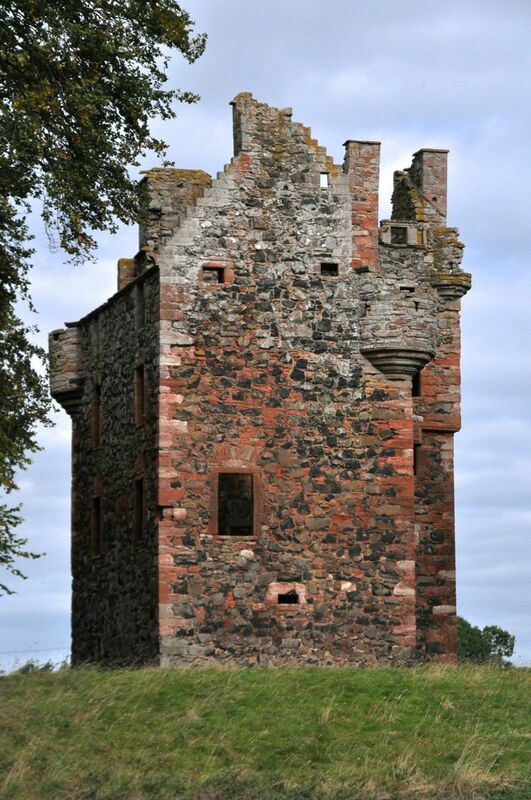 It’s a “tower house”, apparently common in medieval Scotland, built by owners of small estates (a Scottish laird) as a defensible residence. This tower, built in 1581 (the date and owner’s initials are inscribed over the door), is a later tower house, built more as a residence than for defense. Many castles here have been modified and re-purposed over the ages, but this tower house has not seen much change! We think it’s neat to see what a “real McCoy” was like. So let’s go in! there would have been wood floors above separating the two upper stories. A smaller stair accessed the bedrooms; there were two rooms on each floor, each room with a fireplace. Pretty cool, isn’t it? Life in the 1500’s, and you are there. Large gardens used to be located nearby, as well as an “outbuilding”. Throwing sewage out the window was apparently a city phenomenon. The pastoral scenery continues as we travel further, along with occasional “mini-mountains”. They’re just too big to be called hills. many UK towns, it has a lot of charm. And like many (all?) 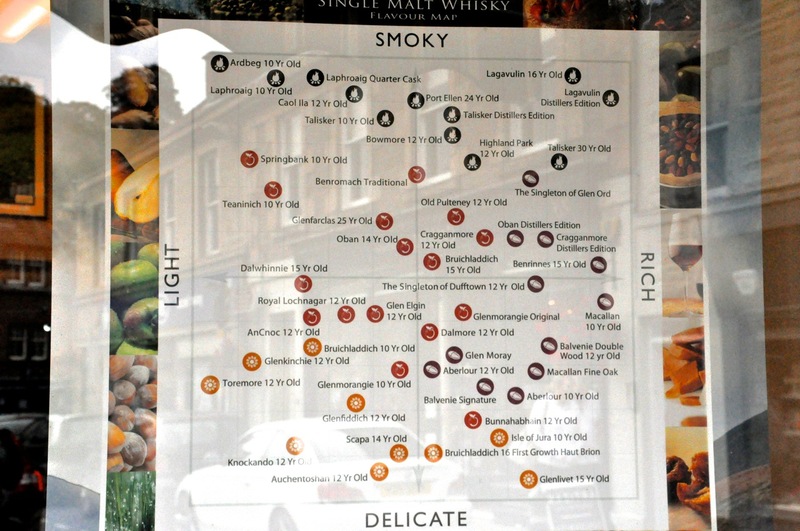 towns in the UK – Scotland in particular – there is a store here specializing in Scotch Whiskey. One of my goals for our Scotland tour is to become knowledgeable of this local firewater. In general, during our travels, we try to focus on learning , choosing our countries carefully. The red wines of Spain, the beer of Belgium, the wines of New Zealand … so why do you think we’re now headed straight to Scotland? Good planning, I say! I do know a bit about Kentucky bourbon, but basically nothing about single malt Scotch whiskey – although I know it’s highly regarded (and can be very expensive). So I’m off on my exploration! Starting now! One of the things I quickly learned was the value of a “Scotch map”. For some reason they’re hard to come by in hard copy, but right outside the Scotch store there’s a huge sign. Laddies, I’m tellin’ ya, if you’re drinking Scotch, this graph is invaluable! My gift to you. And we will be visiting some of these distilleries, so stay tuned! Sorry about all the glass reflections, couldn’t help it. Presenting some history of the Melrose Abbey is in order, because it has a lot of history associated with it. 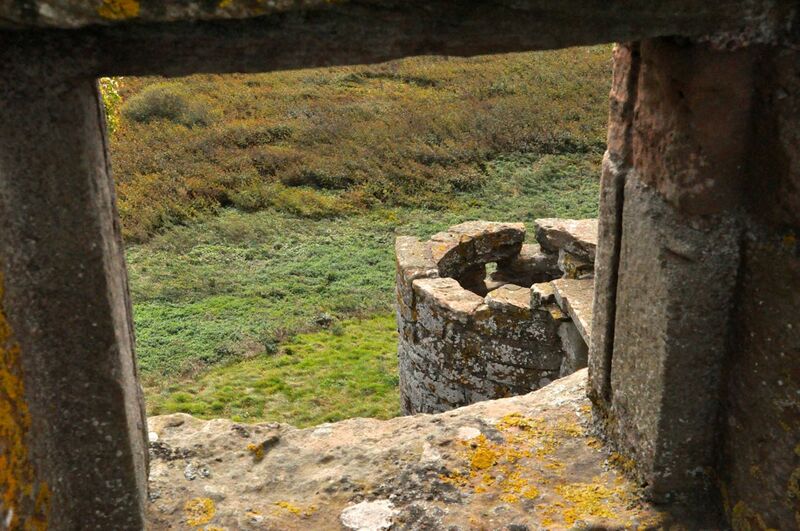 An earlier monastery was built nearby in the early 600’s, dedicated to St. Aidan of Lindisfarne (remember Aidan from the post “Bamburgh Castle“, Feb 23, 2015?). St. Cuthbert grew up here and was Prior in 662 before he moved to Lindisfarne (remember him from the post “Durham and its Norman Cathedral“, Feb 6, 2015?). That earlier monastery was sacked in 839. Much later, King David I of Scotland decreed that a new abbey be built. The east end was completed in 1146, in Gothic style, and the rest was finished over the next 50 years. It had a hard life. The abbey was destroyed by the English King Edward II in 1322 but rebuilt by King Robert the Bruce (national hero of Scotland who decisively defeated Edward II in the Battle of Bannockburn to create an independent Scotland; more on him in an upcoming Stirling Castle post!). The rebuilt abbey was then destroyed by Richard II of England in 1385, but rebuilt again beginning at century’s end and continuing into the 1400’s. It is the ruins of that last church that stand today. 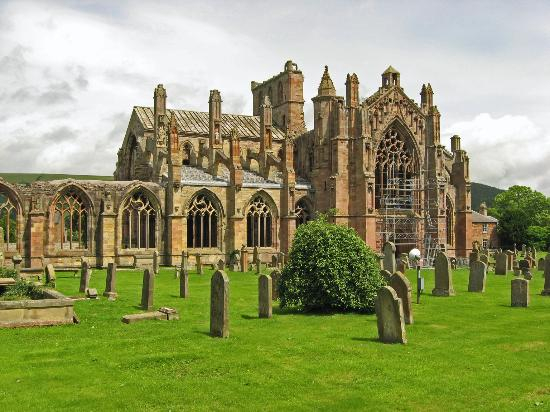 The Melrose Abbey was one of Scotland’s richest and most powerful medieval abbeys, its late-14th-century architecture among the best in the UK. Robert the Bruce asked that his heart be buried there, and a number of other Scottish kings lie there as well. Alas, the abbey’s problems did not end; it was again damaged by English armies in 1544 and never fully repaired. The last monk died in 1590. Cannon fire further damaged its walls in 1650.
under pedestals and at arch ends. Nicely done! And of course the gargoyles. The first one, in case you’re wondering, is a pig playing a bagpipe! monk urinals and (sometimes) macabre arch bosses, there were some fabulous large mosaic floor tiles from the abbey, dating from the 13th century. The floors would have been magnificent! 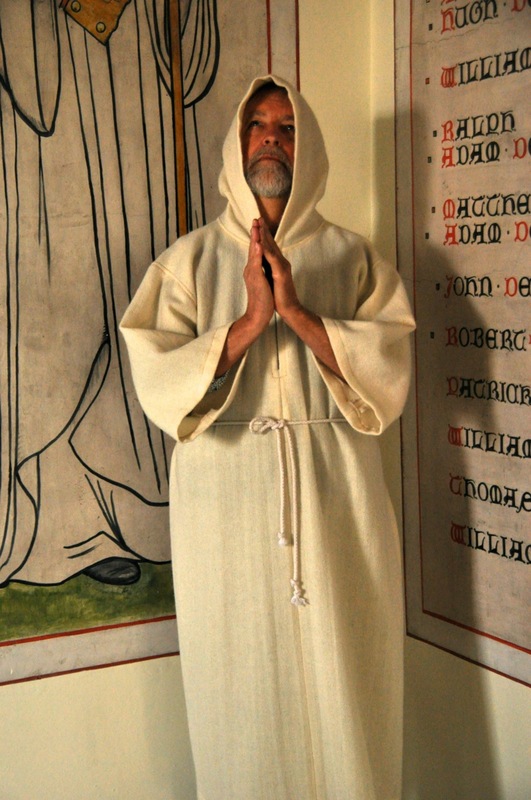 In spite of my most fervent prayer, I did not make the cut for Monkhood. So back on the road again. Next stop is the most important castle of Scotland, Stirling Castle. There’s a lot of Scottish history associated with that castle, which I’ll touch on, but after that post the history lessons will pretty much go away. That might make you sad, but the rest of Scotland is so amazingly spectacular that you will not care. Promise! This entry was posted in Lowlands, Melrose Abbey, Scotland.